But the clincher was evidence from magnetic patterns trapped in undersea iron deposits on both sides of the Atlantic ridge. It turns out that the earth’s poles reverse themselves from time to time, and that iron particles in the newly-forming crust along the Atlantic and Pacific ridges align themselves accordingly. By comparing the magnetic patterns trapped in crust from both sides of the ridges, it’s possible not only to show that they are indeed spreading apart, but to calculate the rate (it’s about the same speed as your fingernails grow). Another Canadian, Lawrence W. Morley, wrote a paper on this, but was rejected by both Nature and the Journal of Geophysical Research, only to see it published a few months later by a pair of British researchers, Vine and Matthews. In 1912, when Alfred Wegener, a German meteorologist, first proposed that the earth’s continents were moving around, the notion was ridiculed. It took 50 years to gather enough data to prove that he was right. Wegener’s idea was prompted by the way the continents seem to fit together like pieces of a vast puzzle: most notably how North and South America fit snugly against Europe and Africa. He also pointed to evidence from the fossil record, which showed that similar animal and plant life had once populated both Africa and South America, and suggested that continental drift could explain how mountains form by collisions such as the one between India and Asia that threw up the Himalayas. Alfred Wegener and continental drift. His idea was poorly recieved when he put it forward. However this was a reasonable reaction at the time. Wegener couldn’t offer any mechanism for his idea and his evidence wasn’t compelling, thus scientists rejected it. It was only after his death that an increasing body of evidence allowed the development of ‘plate tectonics’ as a viable theory and put continental drift on a sound footing. Or the scientist who put forward the Table of Elements and the rule of eight. He was ridiculed by the scientific community for years until others vindicated the work.. Skeptics are sometimes wrong… but why? Ever since the continents were all mapped, people had noticed that many coastlines, like those of South America and Africa, looked as though they would fit together if they could be moved like puzzle pieces. Alfred Wegener was one of those people. Though trained as an astronomer, he was a specialist on Greenland. He noticed that, based on nineteenth-century longitude determinations, it appeared that Greenland had moved a mile away from Europe in a hundred years. And Paris and Washington, D.C., seemed to be moving apart by about 15 feet each year while San Diego and Shanghai got about six feet closer. On top of that, Wegener learned that related species, too small to swim the oceans, were found on different continents, as were similar fossils. In 1912 he proposed that the continents we know today were once all attached in a single landmass he called Pangaea (Greek for "all earth"). They were surrounded by one global ocean, but then broke apart and somehow "drifted" to their separate places on the globe. Although the calculations of Greenland’s movement were found to be due to faulty determinations of longitude, the other evidence seemed to match up: the shape of the continents, fossil evidence, matching rock types and geologic structures, and evidence of ancient climate patterns. But Wegener could not come up with an acceptable way to explain how the continents moved. In 1910, Wegener noticed the matching coastlines of the Atlantic continents — they looked on maps like they had once been fit together. He was not the first to notice this, but it was an idea that would never leave his thoughts. In 1911, he published a textbook on the thermodynamics of atmosphere, but at the same time he pursued his studies of the continents. He first spoke on the topic in January of 1912, where he put forth the idea of "continental displacement" or what later was called continental drift. The year 1912 was busy for Wegener: he got married (to the daughter of Germany’s leading meteorologist) and he returned to Greenland, making the longest crossing of the ice cap ever made on foot. Though he served in World War I and was wounded twice, he published his ideas in 1915. They constituted the first focused and rational argument for continental drift, but still they veered radically from the accepted beliefs of the time. Some scientists supported him. 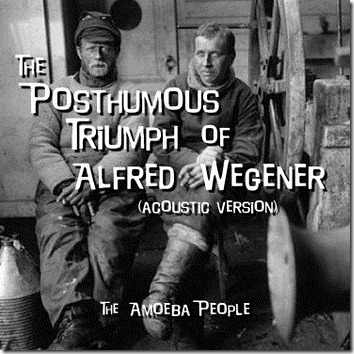 Still more scientists opposed him — including his father-in-law, who seemed annoyed that Wegener had strayed from meteorology into the unknown territory of geophysics. The established reputation of many of his detractors probably gave more weight to their criticisms than was merited. Wegener often complained of their narrow-mindedness. Nice post which The ruling theory posited that the earth shrunk and shriveled, like an old apple, causing mountains to form. Unlike Continental Drift theory It could not explain why mountains were unevenly distributed over the earth, nor why Norway had coal which originated in tropical climates, nor why there were similar fossils on both sides of the Atlantic. Thanks a lot for posting. Continental Drift theory is rank bull sh*t. So is Einstein’s relativity theory(s). Galileo was a thief who stole the idea for a telescope from Hans Lippershey. Don’t take my word for it. Go to swimming pool and get a plank of flexible waterproof foam rubber. Try to get it to plunge under the surface. The subducting plates are believed to dive into a denser mantle without a power source. NONSENSE! THE ACTUAL MECHANISM TO ACCOUNT FOR THE PLATES IS THAT THE EARTH IS SLOWLY EXPANDING. OMG he’s right. The Earth’s expanding and black people are getting smarter day by day.